The Brillo International Bounce was launched in 2013 by Graham Taylor as a competition exclusively for Small and Medium dogs. It was named after a small dog he used to have - and yes, you guessed it. It's Kennel Club name was Brillo Pad. 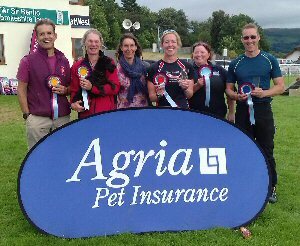 In 2017 Agria Pet Insurance agreed to sponsor this competition as part of their overall programme to support the sport of Dog Agility. According to Luke Taylor of Country Shows Agility, there will be no Brillo Bounce in 2019. The Agria Brillo Bounce, the only competitions in the UK open to all grades of Small and Medium Agility dogs, was warmly welcomed to the British Agility Championships on 13th October 2018. The five qualifiers at each size from each heat were invited to the Final, kindly judged by Natalie Webb. The first two rounds were not against the clock. For some, three clear rounds in almost as many hours got them to stand on the podium with some bubbly to help them celebrate along with a share of more than £200 of prize money. Our finalists reckoned a good day was had by all. Having won the Small Final back in 2015 with the now retired Ag.Ch. Quiksilver Shooting Star, this event holds fond memories for me. Bury Farm and The British Agility Championships offered the perfect setting for the Finals. The atmosphere in the Main Ring was brilliant, and the live streaming was an extra special touch. I was really pleased with how all three courses ran. Due to the tight show timetable, the highly respected international judge Ivan Amez Almerez of Spain very kindly stepped in to judge the Jumping round. The competitors were a mixture of grades so my main focus in the designing stages was to ensure I set something that was testing in parts yet achievable for all. And, of course, I wanted them to be fast, flowing and fun! The standard across the board was fantastic. My first dog was a Sheltie, I will always have a bit of a soft spot for the breed, so it was a pleasure to watch some up and coming young dogs attacking the courses. However, it was the Spaniels that ultimately stole the show by taking the top two podium places in both heights. 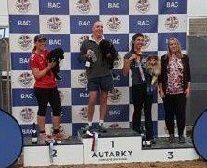 In Small, an unfortunate wrong turn put Sam Lane and Ninja Zippy into 2nd place behind agility legend Alan Bray and Tacita, whilst in Medium, Dani Smillie made it a the double with the lovely Folly and Mungo. I thoroughly enjoyed the experience and I hope that people continue to support this unique and inclusive event. Thank you to Graham, Luke and the whole of the Agria Brillo Bounce team for inviting me to judge. 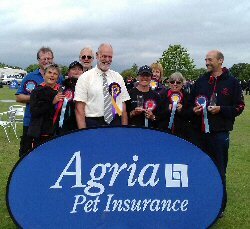 With many thanks to our hosts, British Agility Championships, our judges, our sponsors - Agria Pet Insurance and, most of all, to our finalists for coming to take part. We really hope you enjoyed your day. Whilst there are always winners, if you were not successful this time, there’s always next year and we look forward to seeing you then! The competition, divided into Small and Medium dog agility events, includes ten qualifying heats during the spring and summer, culminating in a thrilling final in October at the prestigious British Agility Championships. Grades able to take part in each Agria Brillo Bounce heat will be determined by individual venues, with all seven grades eligible for the competition. The top five places in both the Small and Medium classes at each venue will receive an invitation to attend the Final which takes place at British Agility Championships, Bury Farm Equestrian Centre, New Bury Farm, Slapton on Saturday, 13 October 2018. 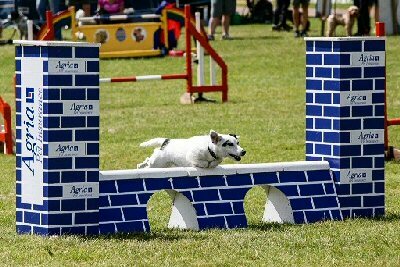 Showcasing the very best of British agility, the British Agility Championships is the ideal venue to host the Agria Brillo Bounce finals. The Small and Medium Semi-finals will consist of two rounds - one Agility and one Jumping. They will not be timed, although a maximum course time will be specified. Double clears will go forward to the final. In the event of no double clears at either size, a maximum of ten dogs with the minimum combined faults will be selected. All double clears will compete in the final round which will be a jumping round against the clock to find the 2018 Agria Brillo Bounce winners and enjoy a share of the £100 prize money at each size. 2018 qualifying heats are set to take place at the following shows. To see the results, follow the link. At over 125 years old, multi award-winning Agria is the world's oldest pet insurer. Working closely with vets, rehoming organisations and breeders, Agria specialises in pet insurance and only offers lifetime policies. Their total focus on the animals they provide cover for has resulted in polices designed to be there when owners need them most – whether that’s following an agility-injury or supporting a dog with a life-long condition. Agility training enriches dogs’ lives by giving them a mental and physical outlet, enhancing their level of focus and self-assurance while encouraging a strong owner/ animal bond. Agria is proud to support an activity that fosters such positive outcomes. Agria Pet Insurance, administrators of Kennel Club Pet Insurance, is based in the UK and provides thousands of cats and dogs with affordable, flexible lifetime policies with a high level of vets’ fees cover. 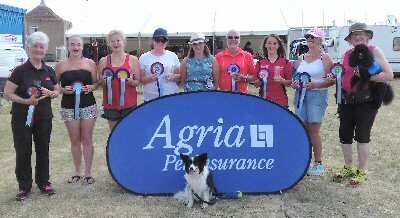 It was a privilege to judge my first qualifier at Scunthorpe agility show and possibly finish my judging career on a high judging the qualifier as my last class. I have decided after the show I am going to hang up my judging boots after judging just short of 8500 dogs and carrying out 28 judging appointments. With a busier full time job than before and helping at shows, I want to enjoy the days off with my own pooches. Everyone was very friendly, nice to their dogs and up for the challenge. Some of the partnerships I saw were amazing and certainly ones to watch in the future especially the young girl who ran the black Cocker. And wow the running contacts were breathtaking as it was a straight dog walk jump finish! A few handlers who stuck in my mind were Sam Lane, Alan Bray and Jo Gleed - all of whom, I believe, were all running young Cocker Spaniels. I will certainly be keeping my eye on the Final, hoping someone who qualified at Scunthorpe goes on to win the Final. Good luck! It was another fab day of agility in the sun at Severnside. It was very hot and the third day of competing of the weekend. Many thanks to Severnside DTC for hosting the qualifiers on what was the hottest day so far this year in front of thousands of show visitor with gun shots in the background and BBQ smells wafting in. 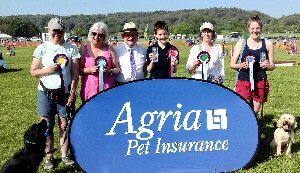 Thank you to our judges Julian Bartram (Small dogs) and Anthony Bray (Medium dogs). We made sure the dogs were kept cool and happy throughout the day. The previous two days of competing had gone well with Rudi gaining his last win for Grade 6 and also enough points for his Silver Warrant. Rudi then won the G5 Jumping prior to running the Agria Brillo Bounce qualifier. It was his last run of the long weekend and we were both tired. Rudi and I were the first to run, and he started the course slower than normal. Normal service was resumed with Rudi yipping in excitement after exiting the tunnel at number 4! I was pleased to finish the weekend with a clear. I watched a few other dogs run and saw some lovely clears. I thought I may be in with chance of qualifying and that I may be lucky to be placed 3rd. I was totally surprised to have won the class! Thank you to Anthony Bray for a great course. I loved running it. To win and qualify for the Final was such an amazing way to finish a fantastic weekend of agility with Rudi. Many thanks to Wye Valley DTC for hosting the Small and Medium qualifiers on 2nd June at Priory Farm on the banks of the lovely River Wye in Monmouthshire. The judges were Ben Elsworthy (Small) and Curtis Alway (Medum). 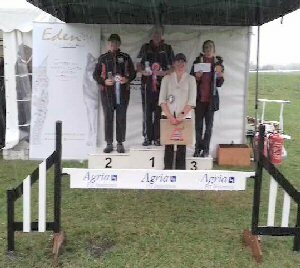 Judge Ben Elsworthy thought his course ran well and he congratulated all the winners. Many thanks to Golden Valley DTC for hosting the qualifiers at the Top Barn show in the continuing good weather. 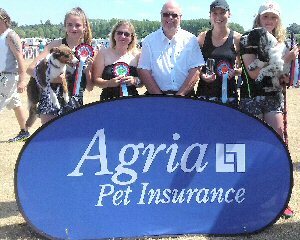 Judge Nick Chettle said, 'I was honoured to be asked to judge the Agria Brillo Bounce heat at the Golden Valley show on 16th June 2018. I set a fairly fast and flowing course that I think the competitors enjoyed – at least quite a few of them told me that! 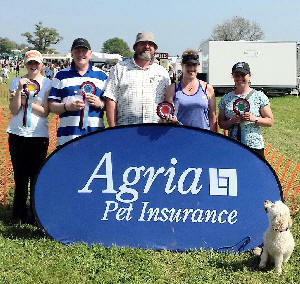 As expected, the standard of the dogs and competitors was high and the atmosphere was cheerful and good natured. The venue at Top Barn Farm, Holt Heath, Worcester is good with nice views and the surface was flat and even, nice to run on. The weather was great for dogs and humans. 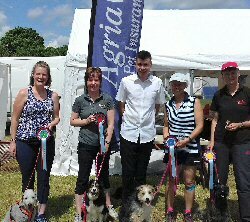 Many thanks to Just Dogs Live for hosting the Agria Brillo Bounce qualifier, judged by Steph Ayres, in the continuing good weather. Many thanks to Rugby Championship Agility Weekend for hosting the qualifiers in the continuing good weather and to Alan Mitchell for judging. 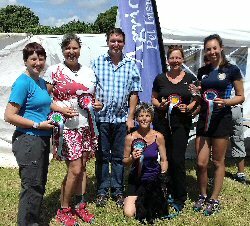 Many thanks to Welsh Kennel Club Championship Agility Weekend for hosting this qualifier, judged by Tracy Bennett in the continuing good weather. 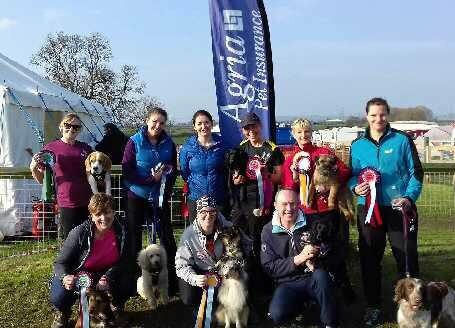 Many thanks to North Derbyshire Championship Agility Weekend for hosting these qualifiers, judged by Helen Veal.